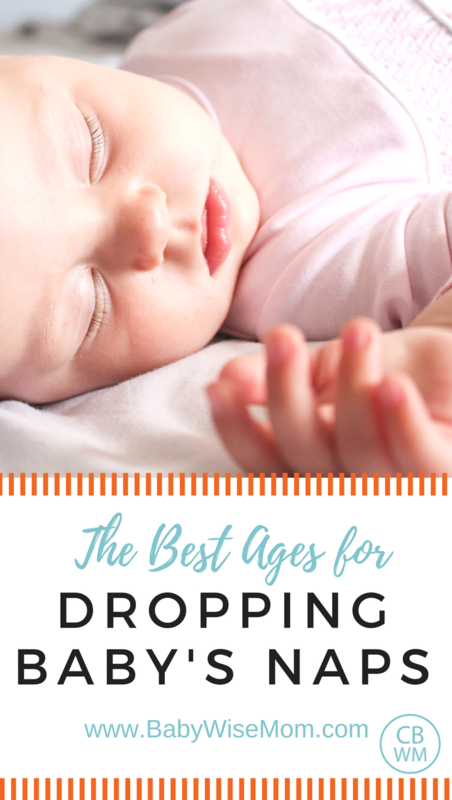 This post discusses the best ages for dropping naps for your baby or child. Dropping a nap is always a little bitter sweet (along with a bit scary–are you doing the right thing?!!?). On one hand, it was nice to have that quiet time to get various other things done without the “help” of the child at that moment. On the other, every nap dropped is an opening to more flexibility and freedom for the family. Babies on a typical 3 hour routine have 4 naps by my estimation. I consider going to sleep around 7 PM or later to be “bedtime” and not naptime. I will walk you through the ages for dropping all 4 naps. 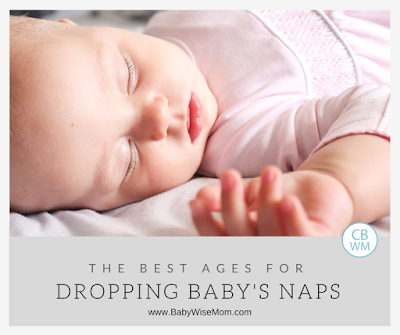 The fourth nap is typically dropped around 4 months old. Pretty easy to remember, right? The range is 3-5 months with four months being the most common. This nap is the most predictable across all types of babies. Both high-sleep needs and low-sleep needs babies tend to drop this nap right around four months old. This is the most consistent age for nap-dropping. Across the board, most babies do this close to 4 months old. The next nap is to drop is the 3rd. This nap might be a short nap for a while before you actually stop having it altogether. The average age for this nap being dropped is 8 months. The range is typically 6-10 months. You can see this is a longer range than the 4th nap was. There is also a lot more variation among babies for exactly when this nap is dropped. See Dropping 3rd Nap Impact and Dropping the 3rd Nap (evening) for more on this nap. The next nap you drop is the first nap, or morning nap. The average age for dropping the morning nap this is close to 18 months. The range is huge. Some are 14 months and some are closer to 2 years old. The age of dropping this nap has a huge variance. Some people even find their baby does best dropping this nap younger than 14 months (though this is very few). See Dropping the Morning Nap Guide for more on dropping the morning nap. By the time you get to dropping your one and only nap, it is just “the” nap. One nap a day goes on for years. The dropping of the one nap goes very slowly, and ideally you will move from it being a “nap” and turn it into a “rest time.” Usually, a 2 year old will sometimes just play through the nap instead of sleep. This might not start until closer to 3 years old. This starts a long process of dropping the nap slowly. I still put my child down for a nap every day during this transition unless we have something going on, like a family party or a day out. I make these exceptions but I know that a nap can be missed without the child losing it completely. As your child gets older, this nap becomes more often a rest time than a nap. Sometime between 4 and 5, you will most likely find most days are a rest and not a nap. You then officially consider this time rest time. See Dropping Naps: Moving To Rest Time and How to Know When Your Child is Ready to Stop Napping for more on this topic. Then the question becomes, when do you drop rest time for good? The answer is completely up to you and what your days end up looking like. I hold on to rest time until sometime during Kindergarten. We have half-day Kindergarten here, so rest time can still happen for us, but we typically stop having it daily during the Kindergarten year. See When To Drop Rest Time for more on when to drop rest time. We still have rest time every Sunday for our children on up to the oldest child (and subsequently, parents!). I will still do rest time on days I think a child could use a nap. I say we will have rest time that day and the child will usually fall asleep. I sometimes re-institute rest time during summer break, also. Fourth nap: Dropped between 3-5 months old. Usually at four months. Third nap: Dropped between 6-10 months old. Average at eight months, though there is a wide variation. First nap: Dropped between 14-24 months. Average is 18, though there is a wide variation. Only nap: Dropped between 3-5 years. Most right around around age four. This is a long process to drop. Move to rest time once this is “dropped”. Rest Time: Can be as early as Kindergarten and as late as never. Hello! Thank you so much for this blog – it has really helped me navigate all of the changes in my son's sleep patterns as he develops. I am coming across a dilemma with dropping the fourth nap. My son is 18 weeks old. We have gotten his first two naps of the day down pat – with each ranging from at least 1.5 hours to most often 2 hours. However, it is after those 2 naps that the rest of the day seems to unravel.Here is his schedule:Feed 1: 6:00 amDown for nap: 7:30 amWaketime: 9:30 amFeed 2: 9:30 amDown for nap: 11:00 amWaketime: 12:30/1:00 pmFeed 3: 1:00 pmDown for nap: 2:00/2:30 pmWaketime: varies dramatically…anywhere from 2:45 to 3:15Feed 4: 3:30/4:00 pmDown for nap: 5:00 pmWaketime: varies dramatically…anywhere from 5:20 to 5:45Feed 5: 6:00 pmDown for the night: 6:30 pmI am trying to be consistent in putting him down at the same time every night and within your recommended 11-12 hours before his morning waketime. That being said, I notice that some nights he goes down relatively easy and other nights he cries for 45 minutes! I think it has something to do with how the last 2 naps of the day are structured but I am not quite sure how to adjust them. I have tried dropping the fourth nap, but the 3 hour waketime from 3:30 – 6:30 seems to be way too long for him. I am considering merging the 3rd and 4th nap by putting him down later for his 3rd nap (say 3:00 pm?) and hopefully having him wake between 4:00 and 4:30. However, I have questions about how his feedings/waketimes are impacted: I am trying to keep him on a 3.5 hour schedule which works great in the mornings but not so well at night. Most days there is only a 2 hour gap between his last 2 feedings. Is this typical? He does not seem ready to drop a feeding but I am concerned that he may not be hungry enough for his last feeding of the night.His optimal wake time is currently 1.5 hours, but if I were to maintain that structure, I would be putting him down for his 4th nap of the day at 5:00 pm which seems way too late if he has a 6:30 bedtime. When dropping that fourth nap, what is the maximum wake time length a 4 month old can handle in the evening? And when you say “dropping a nap” do you mean dropping it entirely or putting them down for a short 30 minute catnap?What should take precedence: a consistent bedtime of 6:30 or an optimal wake time before bedtime? For example, if he wakes at 5:30 pm from his last nap, then technically it would be best to put him down by 7:00 pm. Should I allow for a 30 minute bedtime window (6:30 pm to 7:00 pm) to take into consideration his optimal waketime?Thank you in advance for all of your assistance!